“Montefalco” Sagrantino Secco. Thanks to the geological characteristics of our vineyards, their south exposure, the height and the windy climate they benefit, Sagrantino grapes are rich in sugar, tannin and polyphenols. 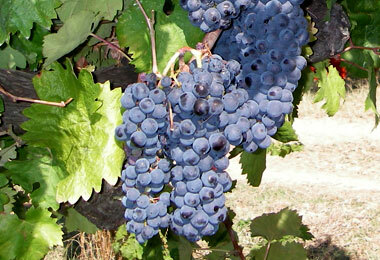 Thus the wine they produce is intensely ruby with a lingering smell of prune, vanilla and spices. Smooth, for a precise choice, in spite of more than 14 % alcoholic content, it can be appreciated even after 10 years, always at 18°-20° Temp. It matches very well with first tasty dishes, truffle, roasted lamb and game. by the Saracen soldjers of the Emperor Frederic II nd. the SACRED WINE of the feasts. Enjoy my… “nocturnal” red, the intense smelling I’ll give off little by little. I love to mach rich foods and being on elegant tables for special happenings.